‘Government intends to comply with Community law and to avoid infraction and any fines that could result.’ ‘Coalition agreement includes the commitment to work towards full compliance with EU air quality standards.’ Which is it – comply now or comply never? Will Government delegate authority and resources to the Mayor and local authorities along with responsibility? Or is ‘Big Society’ about cost-cutting at the centre and passing the buck? 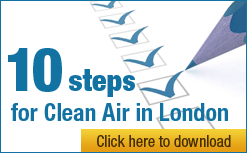 “The Government is in a real muddle over its duty to comply with health-based air quality laws. It says ‘Government intends to comply with Community law and to avoid infraction and any fines that could result’ (para 42) but earlier says the ‘Coalition Agreement includes the commitment to work towards full compliance with EU air quality standards’ (para 3). Which is it – comply now or comply never? Why has the Prime Minister of the ‘greenest government ever’ still not ‘gripped’ this problem? “This response looks part of a last ditch desperate effort by the Government to persuade the European Commission to allow it a time extension until 2011 to comply with the daily legal standard for dangerous airborne particles (PM10). Surely the Commission won’t be persuaded: yet again we are told there is ‘work in progress’ but there is still nothing new or tangible from the Government. Simon Birkett said: “The overwhelming impression created by the Government’s response to the excellent EAC Report on Air Quality in the UK is that the whole of Government is still in a muddle about how and when it will comply fully with its current legal and moral duties to protect members of the public. 6. Government’s success or failure in communicating the full health impact of poor air quality to members of the public by the time of the second inquiry including the actions people can take to mitigate air pollution and adapt to minimise its effects.